The focus of Part II is on classical and modern approximation methods on the unit sphere in ℝ 3. We will first learn how orthogonal polynomials on the unit sphere are constructed. 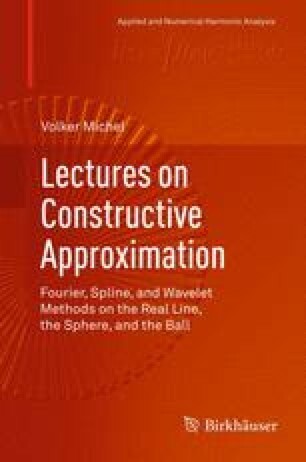 These polynomials—the spherical harmonics—have particular properties which are also essential for the construction of localized trial functions, such as splines, wavelets, and Slepian functions, on the sphere. We will also see that the spherical splines and wavelets have analogous properties in comparison to their 1D counterparts. Before we can discuss the really interesting stuff, we need some definitions, notations, and basic propositions of spherical analysis.